Now-a-days many bloggers and website owners are using Adf.ly, Adfocus, LinkBucks and some other Ad Network Programs for making large amount of money. But unfortunately in some countries like India and other Adf.ly is banned therefore Indian can't bypass adf.ly links. 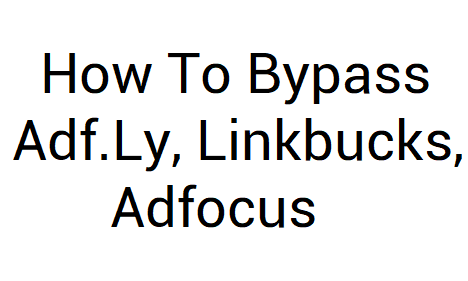 Also its damn riddiculas that everywhere you go on internet you will see damn download links equipped with adf.ly shorten urls, well, today I'm going to explain about "How to Bypass Adf.ly Adfocus, LinkBucks and Other Ad Network Links with dead.altervista.org"
How To Bypass Adf.ly , Adfocus, LinkBucks and Other Ad Networks ? Its so easy just go to http://dead.altervista.org/ , you will see there a box where you can paste your Adf.ly or any other Ad Network Link. Just copy and paste your Link there in the box and hit "Deadfly" and wait. Boom ! After 4-5 seconds you will see original link or source link of that shortened link. Which means you can bypass adf.ly easily via copying it or clicking it. I think its really awesome for Indians as Adf.ly is banned in India or in other countries. You can also download Dead.altervista.org Android app for better experience on android base phones. Just copy paste that link and paste it in your browser, enjoy browsing ! If you have any problem regarding this post just drop your comment here or saying simply a "Thanks" might be appreciable. Yay, nice article. These ad networks almost ruin browsing pleasure when I am browsing across sites that offers something for free download. Now I can beat it. Thanks man.